One pleasant San Francisco afternoon, people watchers sitting around drinking coffee along the city’s fashionable Maiden Lane in Union Square take admiring glances at Kate Kelly as she strolls down the famed alley. Wearing a head-turning pink blazer and black slacks, she’s on her way to an interview – to be interviewed, actually. Kelly is right at home in San Francisco. That’s not surprising. Not only is she a Bay Area native, she’s been a very familiar face on TV screens here for a long time. How long? To some, it seems like yesterday that Kelly arrived at KPIX’s Battery Street studios for her first day on the job. That day was Jan. 1, 1984. Now she is achieving something few people in the business can say they’ve accomplished: lasting, at the same television station for over 35 years. 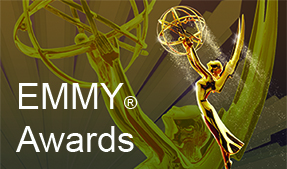 The Emmy® Award-winning Kelly has practically done it all in her years at the Bay Area’s CBS station. In addition to being a reporter, she’s also anchored nearly every newscast at KPIX. Several months after she arrived there, she began co-anchoring the weekend evening newscasts with Doug Murphy. Kelly has also anchored the station’s 4:30 and 5 p.m. newscasts as well as its 11 p.m. broadcast, with the legendary Dave McElhatton. Kelly has also covered nearly every major Bay Area story, from Pope John Paul II‘s visit to San Francisco and the Loma Prieta earthquake to stories of every scope. Inducted into the Silver Circle of the San Francisco/Northern California Chapter of the National Academy of Television Arts and Sciences in 2005, Kelly grew up in Belvedere, in Marin County. Her mother passed away when she was a young girl. Her father sent her to San Domenico School, a Catholic girls’ school. Kelly graduated from Stanford University in 1979, and her career immediately took off. After graduation, she was hired as an anchor, reporter and photographer at KRCR-TV, a station in Redding that, at that time, had dual affiliations with ABC and NBC. “I did everything there,” Kelly recalls. “I shot, wrote and edited my own stories. I swept the floor. Everything.” Kelly remained in Redding for one year before moving on to a larger market – Austin, Texas – and a new station, KVUE. There, as an anchor and reporter, she remained three years, and, during that time,the station won the United Press International and Associated Press honors for Best Newscast in Texas, three years in a row. In late 1983, the Bay Area appeared on Kelly’s career horizon, and it was time for her to return home to her native San Francisco. KPIX came calling. Kelly answered the call, and by November of that year, she was back home. She began at KPIX on Jan. 1, 1984, as a general assignment reporter. “Joe Fonzi and I started on the same day,” Kelly says of her first day on the job with her then-sportscaster colleague (Fonzi is now across the Bay at KTVU in Oakland). In a matter of months, Kelly was promoted to the anchor desk, sharing weekend anchor duties with Murphy. 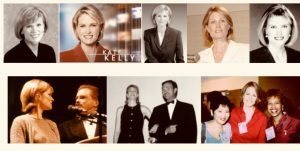 Kelly’s career was not only taking off, but she had become a critically-acclaimed television journalist before she was 30 years old. 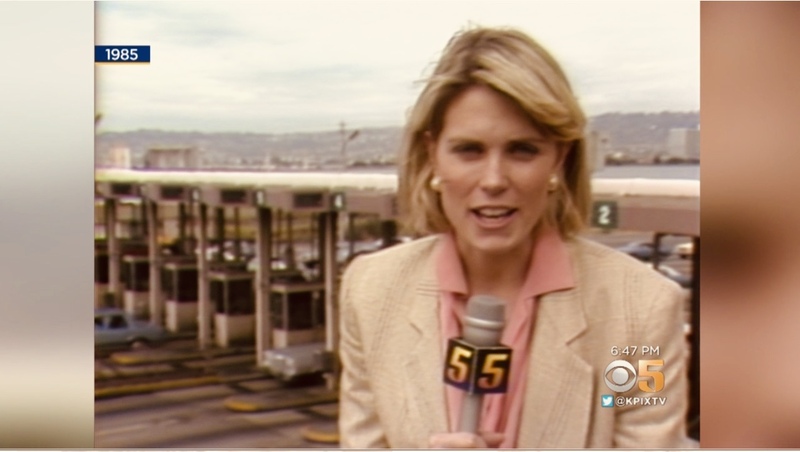 In 1984 – the year she started at KPIX – Kelly was named Outstanding Young Journalist by the Society of Professional Journalists. More accolades would shower upon her in the years ahead. While Kelly’s career at KPIX prospered as a reporter, she was also prospering as an anchor in what was then the nation’s fifth-largest television market. Management took notice, and in 1987, Kelly began anchoring the station’s 11 p.m. newscast on weeknights, sharing the desk with McElhatton. Following hers and the station’s earthquake coverage in the days and weeks to come, Kelly’s anchoring duties expanded to include the 5 p.m. newscast weekdays, with McElhatton, in addition to her 11 p.m. responsibilities. 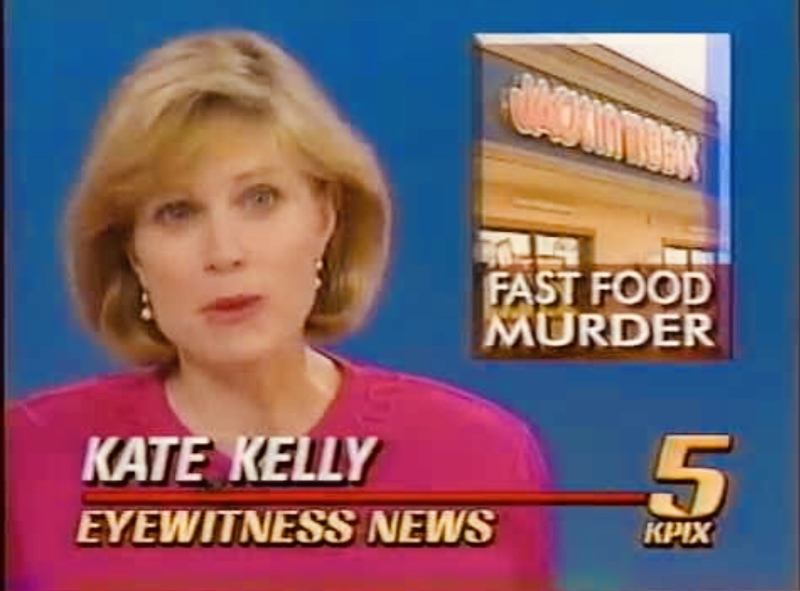 Kelly remained on the weeknight anchor desk until 1999, when she shifted gears to strengthen KPIX’s morning newscast with then-co-anchor Ken Bastida. The following year, she returned to the anchor desk on the 4:30 and 5 p.m. newscasts weekdays. Through her nearly three decades at KPIX, Kelly has covered practically every kind of news story. Among the most notable examples of her unique storytelling, Kelly reported on the devastating Oakland Hills firestorm in 1991 and the visit by Pope John Paul II to San Francisco and the Bay Area. “It was the Pope’s first tour to the U.S.,” Kelly says. “”We went to Rome, got on his plane, and came back to the Bay Area with him. The Pope would then come out of first class, and talk with all of us journalists on the plane.” Kelly has also covered numerous stories about AIDS, including Ward 5B at San Francisco General Hospital – the AIDS ward. On the flip side of her reporting, Kelly has flown with the Blue Angels during a Fleet Week appearance over San Francisco Bay. 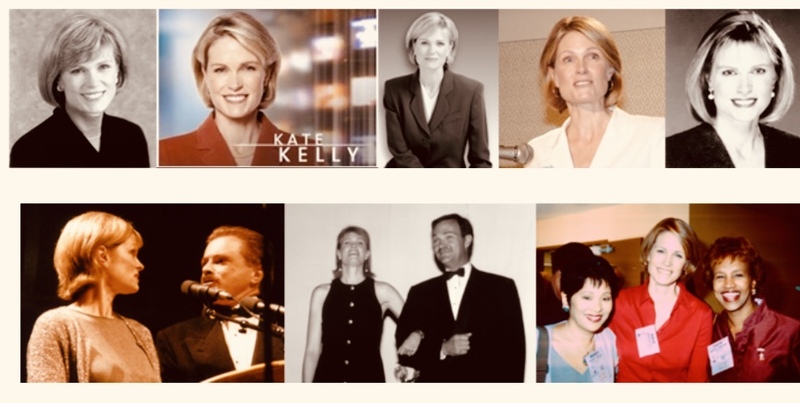 In January 2005 – at the beginning of her 22nd year at KPIX – Kelly launched the first of the Bay Area Jefferson Awards, a weekly tribute to volunteers performing outstanding public service in the community. Working together with the National Institute for Public Service in Washington,D.C., along with a local committee of non-profit representatives, KPIX accepts nominations, then selects Bay Area award recipients. Kelly’s contributions to the station’s Jefferson Awards coverage led the station to be recognized with an Emmy® Award for community service. Kelly and the station have also received the Good News Award for their series by the Northern California American Women in Radio and Television organization. “I’m so proud to be a part of these Jefferson Awards,” she says. “We do 52 stories a year. We shoot each story in a day. Because they’re long-form stories, it’s not a same-day turnaround.” Kelly enjoys telling the stories of those she spotlights for the Jefferson Awards. “We profile people in the Bay Area who do outstandingly as volunteers in public service,” she explains. During her years at KPIX, Kelly has had many stories affect her personally, such as the California Burn Relay, begun by the Alisa Ann Ruch Burn Foundation. Ruch was an 8-year-old Southern California girl who died from burns she received in a backyard barbecue accident in 1970. “For me, for 20 years, covering the relay was one of the most touching stories I could do,” Kelly says. “I was really honored to be a part of that. The firefighters, they’re all heroes, and they’re doing it for the kids. And then, you meet these kids who overcome incredible hardships. In addition to her Emmy® honors and other accolades, Kelly has also been honored by the Radio Television News Directors Association and the California Teachers Association. The Marin County native is “very proud” to have spent over 35 years on Bay Area television. Kevin Wing has been authoring Gold & Silver Circle Profiles for Off Camera since the summer of 2007. Currently with KNTV NBC Bay Area, Wing is a 2013 Silver Circle inductee.